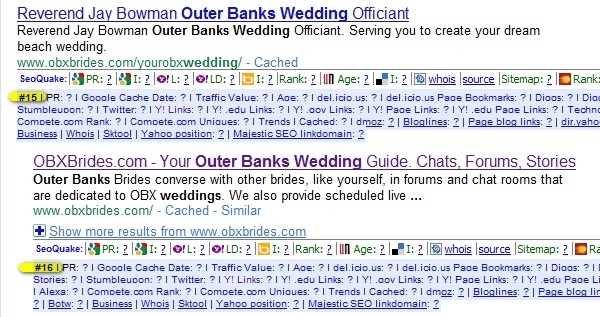 obxBrides initially came to us looking to improve their position on the Search Engines. They were looking for Search Engine Optimization services. They had launched the site a year prior to contacting us and they were on position #65 on Google. We worked with their existing site to clean some of the code, including META tags such as Title and Description, fixing internal anchor texts, and a few other minor on-page revisions. The main campaign started when we launched the blog and started posting valuable wedding tips for the brides that visited the site. This just a snapshot of one of their main keywords over a period of 6 months. This was the first snapshot I took of the domain. It was shortly before our first meeting. This was 12 days after they officially hired us. We had started fixing a few on-page errors and optimizing the site’s navigation structure. Fast forward 3 months – we’ve gained 46 positions and now have a double listing (back then they were still around) smack middle of the second page. This is when the campaign gets more challenging. This is when we reached the first page for the first time – within 5 months, their site went from #65 to #8 on Google’s SERPs. Based on these results, they hired us to completely re-design their site and make their vendor management system more efficient. OBXBrides vendors receive their own page within the site, based on their category, and organizing such structure in WordPress required very specific work from the theme and from the layout as well. We designed their site in WordPress so that they could update it themselves if necessary, but also because of the SEO friendly nature of WordPress. Today, they’ve used us to develop custom MAP widgets, for graphic design, and we’ve brought them to the top of the SERPs for an extensive list of wedding-related keywords on the Outer Banks. Fill in the contact form on the right handside and schedule your FREE Search Engine Marketing analysis – we’ll SHOW you exactly how to improve your results online. Will put it to good use!